Before I talk about this comforting and tasty Vegetable Couscous, I would like to announce the annouce the winner of the "Where Women Cook: Celebrate!" book giveaway. Folks! 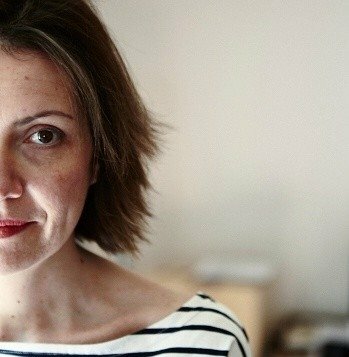 Congratulations to Heather from La Tarte Tatin all the way in Seattle! Heather, please email your snail mail address to mytartelette AT gmail DOT com and I will put the book in the mail first thing Monday morning! 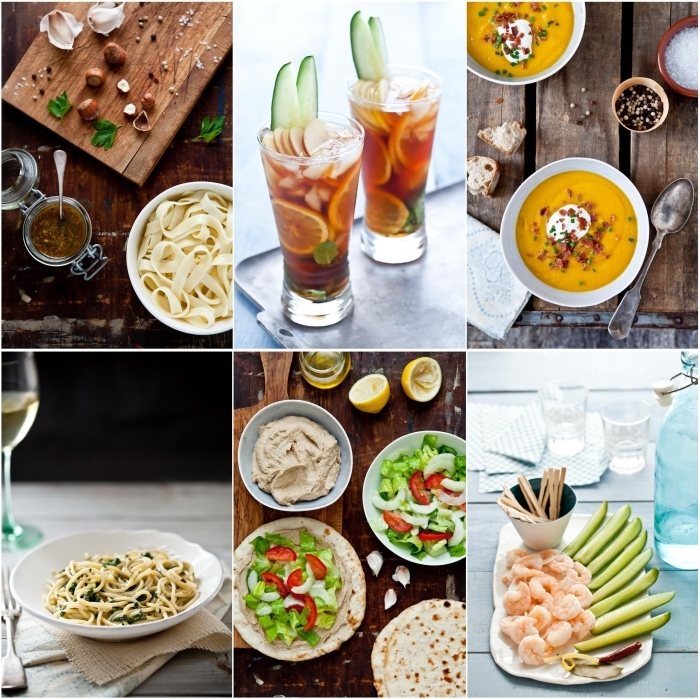 Earlier this year, Food & Wine Magazine assigned recipes to food bloggers and photographers for images for their site. I had a blast shooting the ones they gave me. Less than 48 hours after I had submitted my images, I got another email saying that they loved my images and could I shoot another ten. They were afraid timing was tight before the holidays. Little did they know my schedule! As a photographer, there is little room for normalcy! Weekends, holidays... we follow the food. And I would follow that bowl of Vegetable Couscous everywhere. And I did. It was one of the favorites from the shoot. Reminded me of my childhood. The couscous dish my grandmother used to make, just a bit lighter. We eat everything, with fish and vegetarian dinners being the majority so this was perfectly fit for a light dinner al fresco. Paired with a tomato salad and a glass of rosé, it turned out to be all we needed to satisfy our hunger and enjoy the evening. Hope you enjoy the recipe! Have a wonderful weekend! Note: you can make this gluten free by using gluten free couscous instead of regular one. For the sake of making the recipe as per the requirements of the photo shoot, I used regular couscous. salt, and pepper. Cook, stirring once or twice for another minute. Add 3 1/2 cups of the water and bring to a boil. Reduce the heat and simmer, uncovered, for about 15 minutes. Add the chickpeas, stir and cook another 2 minutes. couscous. Cover ad take the pot off the heat. Let stand for 5 to 8 minutes. Fluff with a fork. 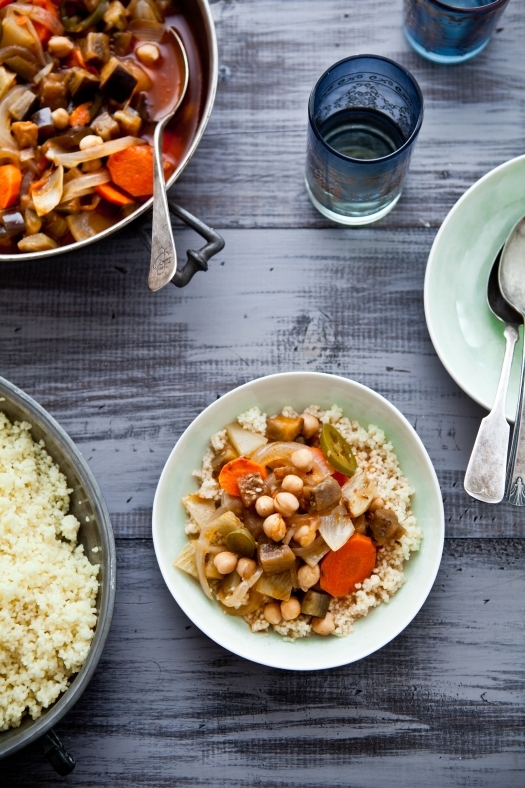 Spoon some couscous in individual bowls and spoon some of the vegetable stew and broth over it. I usually just have couscous plain, but I always wanted to try a variation! oh my this looks and sounds amazing. I love vegetable couscous! I love the speed and versatility of couscous! What amazes me is how beautiful you can make it look. No wonder they asked for more photos. Beautiful pictures, as per usual. As for the cous cous, it looks so comforting and delicious. The vegetable couscous is right up my alley.Gorgeous and delicious looking. 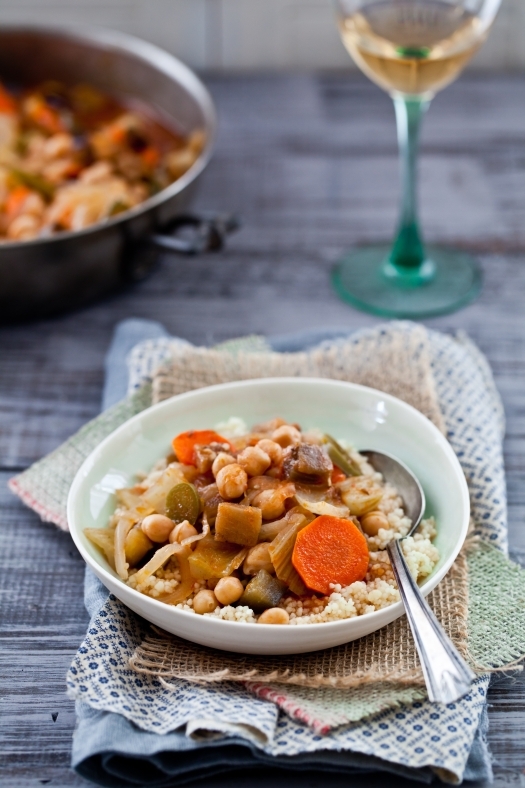 This vegetable couscous dish looks delicious! And your pictures are gorgeous, as always. Please have a look at my blog there is an award waiting for you. Rhubarb & Strawberry Crisps - Spring In A Cup!